Pines in general and Japanese Black Pine in particular are sun loving trees. They should be given full exposure to as much sun as possible each day. Black Pines not only tolerate lots of sun, they actually thrive on it. This has the advantage of producing shorter and denser needle growth and reducing the internodal space. In the fall, excessive needle growth should be thinned to allow the sun to penetrate through the entire plant. Good air circulation and strong sunlight are keys in promoting good health and resistance to insects and fungi and for stimulating the plant to set new buds. Black Pines should be transplanted in the early spring just as the buds (candles) are beginning to swell. This may occur anywhere from late February to mid-April depending upon where you live. Trees should be protected from freezing after transplanting. Soil mixtures may be of a variety of materials, but should provide for excellent drainage. Soil mixes used by the Bonsai Learning Center include turface, pine bark chips, fragmented granite and haidite (expanded shale). The composition is 75% aggregate materials with the pine bark making up the final 25% and acting as the organic component. Pines are slow to react. Consider the amount of time your Christmas tree stays green without the benefit of a root system. Therefore, when root pruning any type of pine tree, proceed carefully. Young trees can be re-potted every two or three years at most. Older, more mature pines should go 4 to 6 years between pottings. 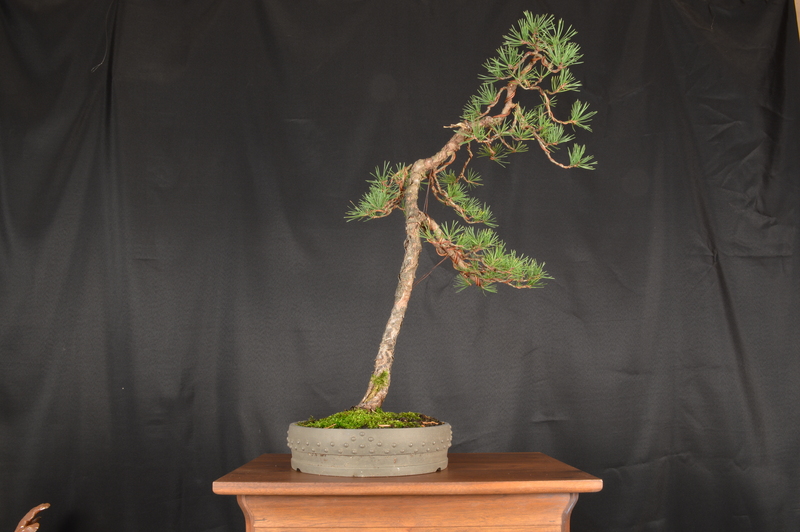 Unlike many other varieties of bonsai, pines generally will not tolerate constantly having their root systems tampered with. This doesn’t mean you can’t transplant them… just don’t get too enthusiastic. The good news is that black pine root systems are much more tolerant of root pruning than most others. Just bear in mind that pine root systems are slower to grow and will not fill up a pot nearly as rapidly as other varieties of bonsai. Hence they will not require transplanting as often. Standard bonsai potting techniques apply to black pines. Generally speaking you can remove up to a third of the plants root system in any one springtime. Chopstick soil carefully, fill air pockets. Soak in a rooting stimulant and place in shade for about a week. Keep the root mass moist , but not soggy and mist the foliage frequently until new roots have had a chance to establish themselves. One of the best aspects of black pine is its tolerance for water. Most bonsaists have a bad habit of watering too frequently. Black pines actually prefer to have their root systems a little on the moist side. 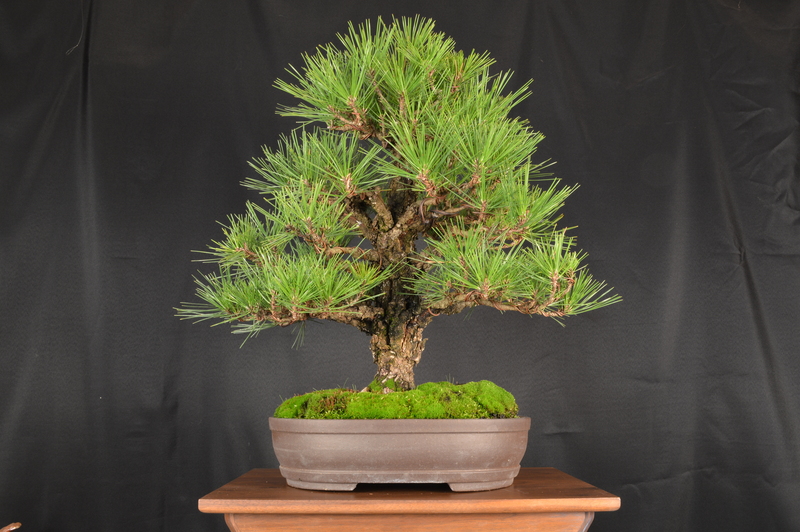 This is in sharp contrast to most other pines (especially Japanese Five Needle White Pine) which do not tolerate being constantly wet. Try to keep the moisture level in the pot constant and to avoid bouncing back and forth between bone dry and soaking wet. The black pine has a considerable tolerance to overwatering, but you can drown it if you apply yourself. If you have planted it in a coarse, well draining soil mixture and keep it in full sun, your chances for success are excellent. There is a relationship between the amount of water and fertilizer you give a tree and the amount of internodal space and needle size which occur. For young trees where growth is needed a general purpose fertilizer (chemical) which is high in nitrogen should be used. This promotes rampant green growth. For older, mature trees an slow release organic fertilizer which is low in nitrogen may be better. I fertilize all bonsai twice per month during the regular growing season. Note: During fall months a fertilizer which is high in phosphorus and low in nitrogen will help the plant to harden off and store up energy for the coming winter months. Japanese Black Pine are very flexible. You may use annealed copper or aluminum as you choose. For pines with heavy or corking bark, it is advisable to wrap the wire in raffia or nursery tape to prevent bark damage. Pines can be wired in the wintertime, but a careful eye is necessary to insure that you do not get wire marks during the spring growth spurt. Because they are so flexible, wire may have to be left longer on pine trees than would normally be the case with other species. The number and size of needles on a black pine can be controlled through a process generally referred to as “needle picking.” Although the needles on all variety of pine trees must periodically thinned, the protocols for thinning black pine needles is much more complex and extreme and should not be applied to varieties other than Pinus thunbergii. Briefly stated the process involves gradual elimination of almost 75 percent of the plants green foliage over a three week period in the late springtime. When applied correctly on healthy plant material, the technique will result in vigorous back budding and production of remarkably smaller needles. Space does not allow a complete description of the protocol here. You are well advised to seek out personalized instruction on this technique and/or do more extensive reading before attempting anything other than general maintenance needle reduction on black pines. Insects and Disease Japanese Black Pine are susceptible to the usual run of insects that infest your other bonsai. You should take measures accordingly. Aphids, borers, saw flies and mealy bugs will attack pines. The most common pine infection, however, is Needle Cast. This is a fungal disease which causes the tips of the needles to turn brown. Benomyl, Zyban and other fungicides will solve the problem, but it will not restore needle color. It is recommended that you put your bonsai on a regular spraying program. An ounce of prevention is worth a pound of cure. Black pines basically fall into three categories. Nishiki, meaning those which have a cork bark appearance; Yatsubusa, meaning varieties with dwarf, small needled or multi-budding varieties; and Seedling varieties meaning those which are cultivated entirely from seed. Nishiki and Yatsubusa they are almost always produced through grafting or cuttings. One of the best seedling varieties being produced in this country is the Mikawa variety. This pine is noted for its deeply fissured and flaking, deep bluish colored bark. In some cases the bark begins to crack and show ridges in about four years. This makes it particularly desirable for bonsai because it can take on an aged appearance in a very short time. Good Nishiki varieties include Gekka Yatsubusa which buds back extremely well, but is not fond of colder climates and Katsuga which trunks quickly and has dark green needles. Yatsabusa varieties include Ban-Sho-Ho with its short thick needles and Koto-Buki which is cultivated widely in Japan.